In India, finding a person who has not heard this dialogue in one format or the other is as difficult as finding water on the moon. Well, finding water on the moon might be easier. But just for the records, this is Rajinikanth’s famous dialogue from the movie Annamalai. And as far finding water goes, you never know, Rajinikanth might surprise you with that too. Rajinikanth Doesn’t Need Water Supply. He Can Mix Hydrogen And Oxygen To Produce Water Wherever He Wants! ROFL! There are some actors who are good looking. There are some who act well. There are others who do both. And then, above them all, there is Rajinikanth. He is a phenomenon. With his scintillating style, dashing dialogue delivery and cool charisma, he never fails to set the screens on fire and leave his fans whistle, dance, and chant his name like there is no tomorrow. And you know what the man himself has to say about his stardom. Today, many actors are seen promoting different brands by becoming their brand ambassadors. But can Thalaiva be an ambassador for a brand. No ways! There is no brand good enough for Rajinikanth. 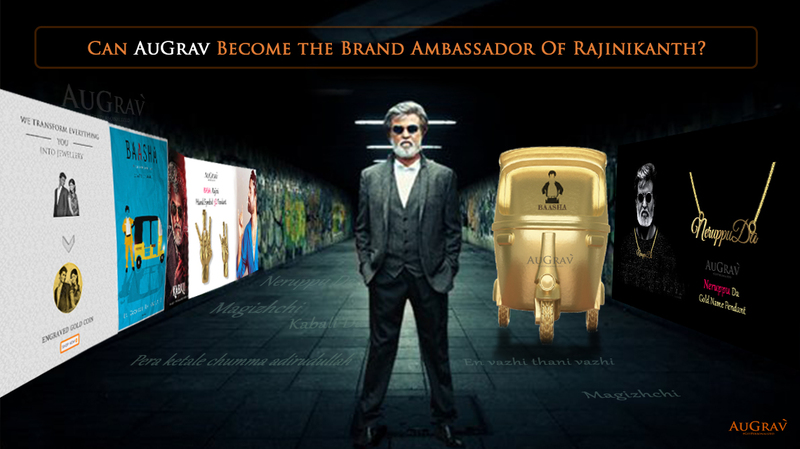 Rather brands need to be ambassadors to the super actor, more like Rajinibassadors. Sounds cool, doesn’t it? It definitely does to us and we thought we will take the next step and become a Rajinibassador. As part of our role as ambassadors to Rajinikanth, we, at AuGrav, have come up with a few products that have Thalaiva’s elements all over it. These are related to his movies and could be an ideal souvenir for every Thalaiva fan. Can’t wait to see what we have in store for you? Here we go! 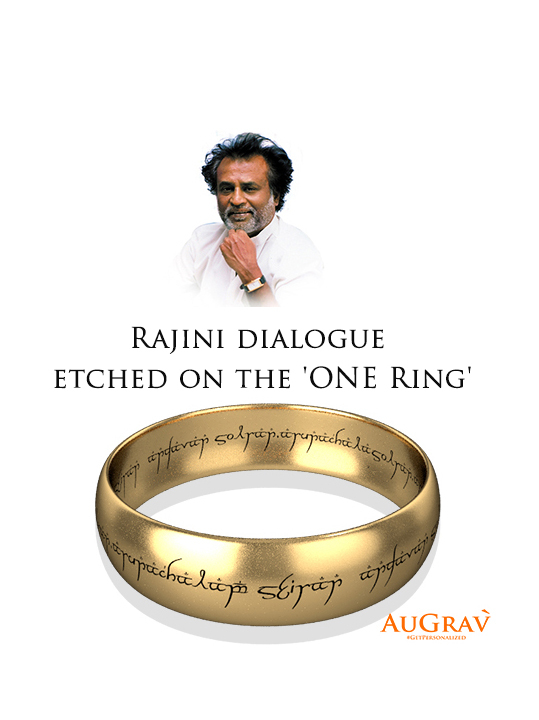 What if Rajini was part of ‘The Lord of the Rings’? Yes, the movie would have been named ‘Thalaiva of the Rings’. We have thought of a similar tweak to the one ring from the movie. By engraving Rajini dialogues like ‘Andavan solran. Arunachalam seiran – Arunachalam’ in that unique font, the ring would become even more special. Super! Rajini’s voice can send chills down the spine of the goons and send them running for cover in a matter of seconds. How about capturing that sound? 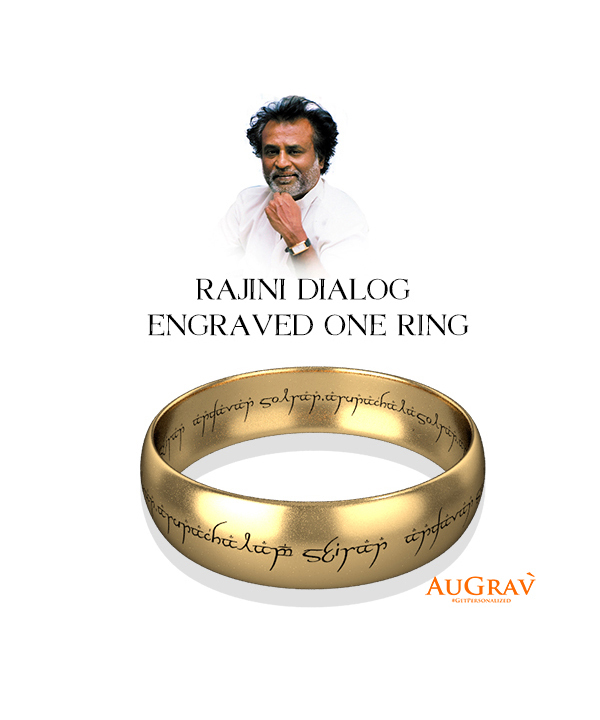 At Augrav, we engrave for you the sound wave of any Rajini dialogue on the ring of your choice. 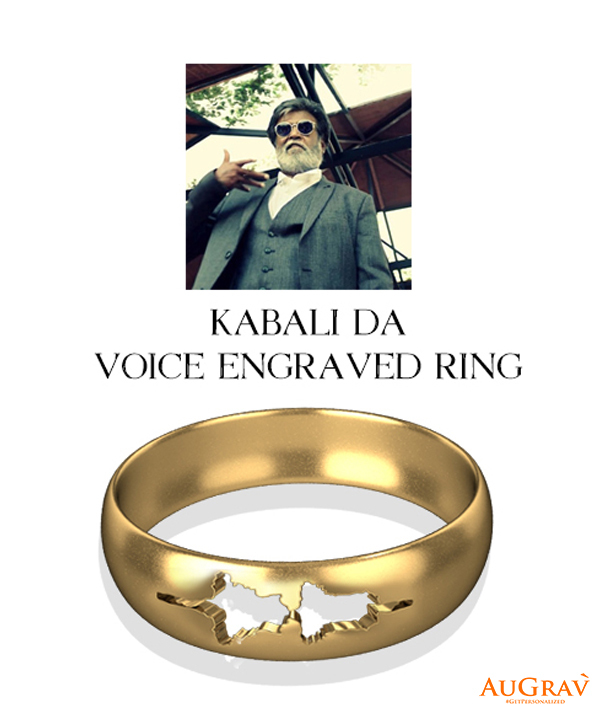 The ring below showcases one such dialogue ‘Kabali Da’ engraved on a gold ring. Over the years, this super star has delivered some classic dialogues and we would like to give you chance to cherish these dialogues forever. 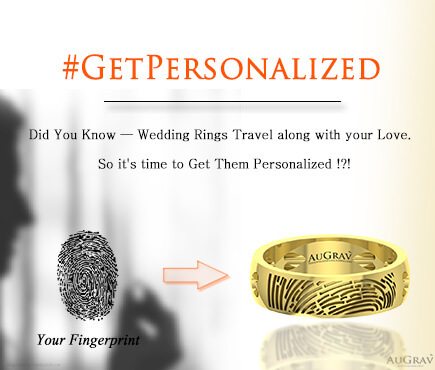 All you have to do is select a dialogue and we will have it engraved on a name pendant. 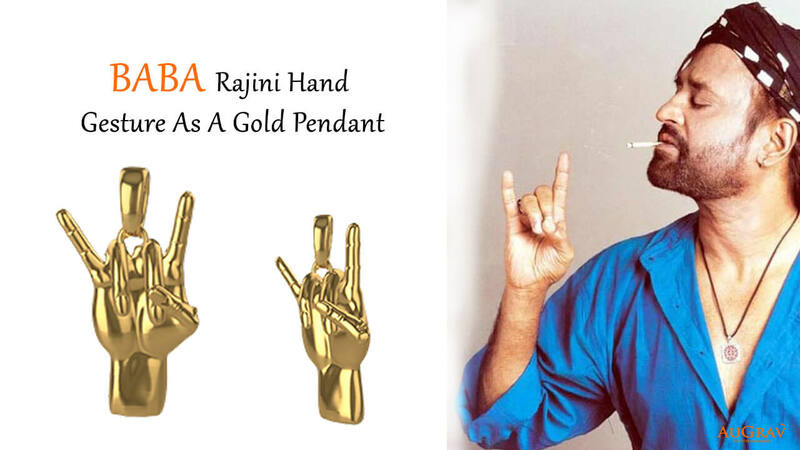 This pendant will hang close to your heart and will be a proof for the love that you have for Rajinikanth. From ‘En vazhi thani vazhi’ to ‘neruppu da’, we will have all his famous dialogues covered for you and that too in different languages. Now, it is time to move from super dialogues to super vehicles. 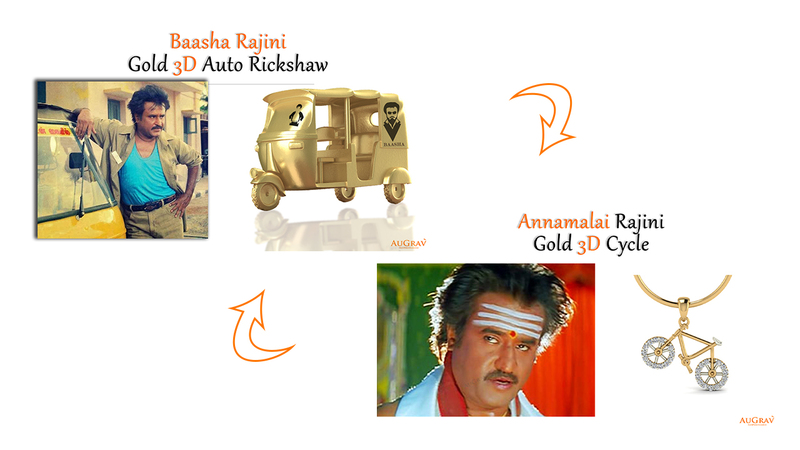 Rajini has used numerous vehicles in movies based on his character and whenever he did, he did it in style. 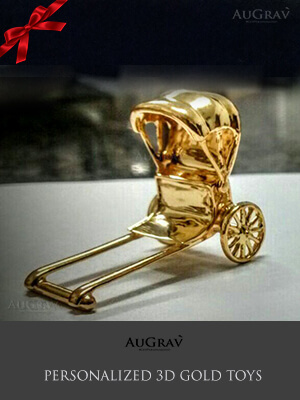 We would like you to relive those special moments with our gold toys and pendants. 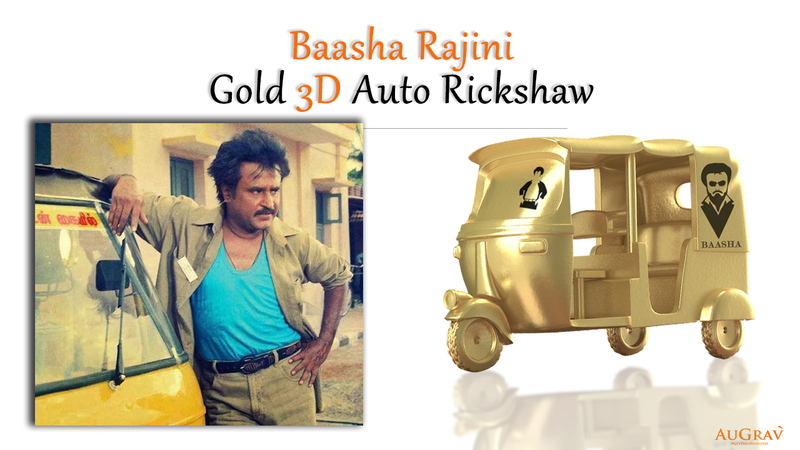 For example, just imagine what it would feel like to own an auto rickshaw toy that symbolizes the famous Manikam character portrayed by Rajini in the movie Baashha. When talking about Thalaiva, how can we miss his hand gestures. In every movie, you can see him doing some gesture that becomes the talk of the town and people keep on replicating that for years to come. One such gesture is the Gatham-Gatham gesture from the movie Baba. And guess what, we have converted this gesture into a pendant. Don’t believe us? Take a look yourself! The fun quotient takes off to sky high level when Rajini enters as M.G Ravichandran at the latter half of the movie Sivaji. Rajini’s performance was superb and so were his haircut, goggles and earrings. As a leading personalized jewellery brand, we thought of coming up with similar pair of earrings that Rajini wears while playing the character. Give our team a call and they will make one for you. It is that simple! One Rajinikanth is enough to make a movie a super-duper hit. Just guess what two will do. This is exactly what happened in the movie Thillu-Mullu where Rajini plays a double role. And after that movie, the moustache style of at least half the men changed to the one that Rajini sports in the movie to distinguish between the two characters. 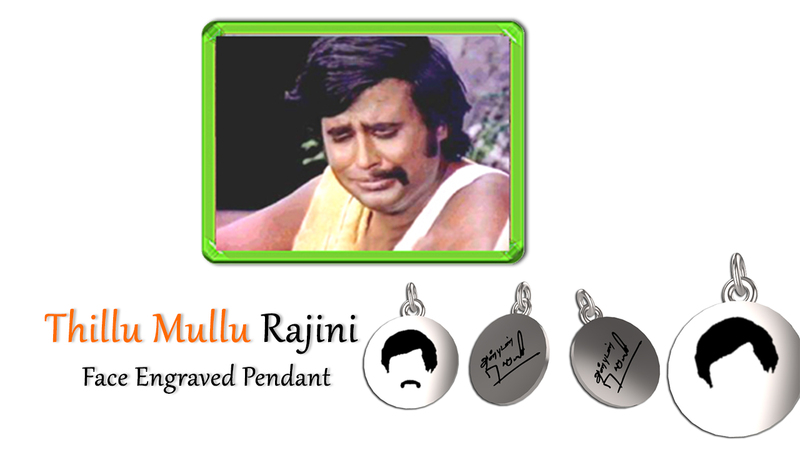 As a tribute to this character of Rajini, we have engraved the moustache and his hair style on a silver pendant. 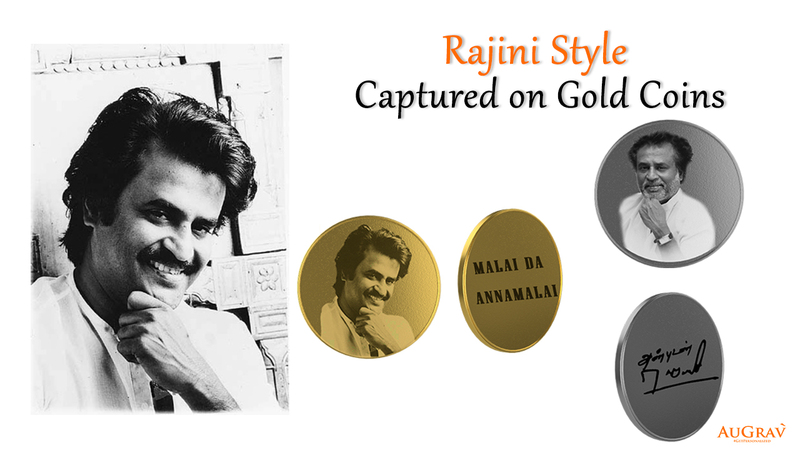 Own it today and flaunt your craze for Rajini with your friends by wearing it. 1) Punch Dialogues as Sound-Wave Pendant! We bet, it can’t get any unique than this! The thing that we relate most to Rajini are his dialogues. 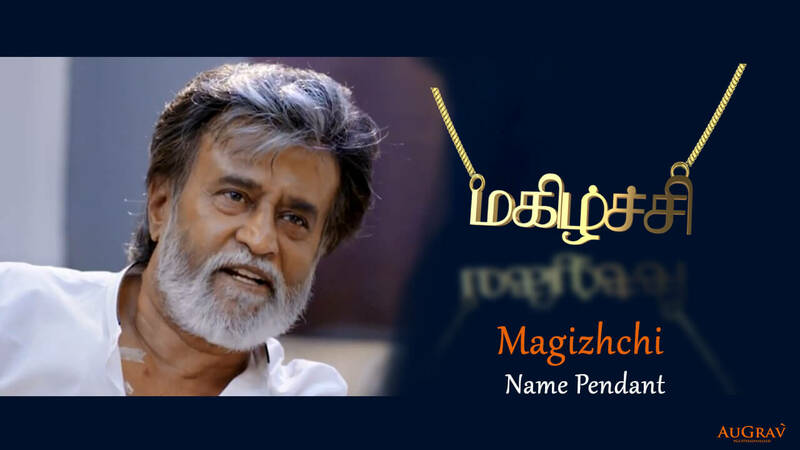 It has been years since Rajini has played those characters on screen and we still love to recite them over and over again. 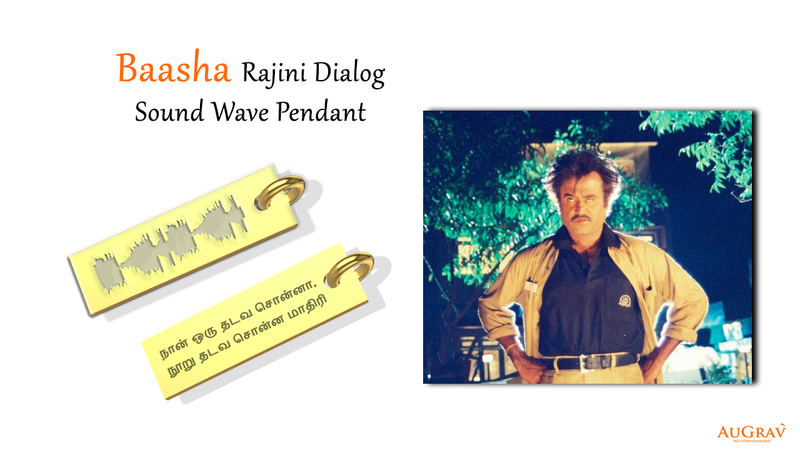 Why don’t engrave his eternal dialogues as sound waves on pendants. This will be both a unique style statement and also a unique possession for every Rajini fan. 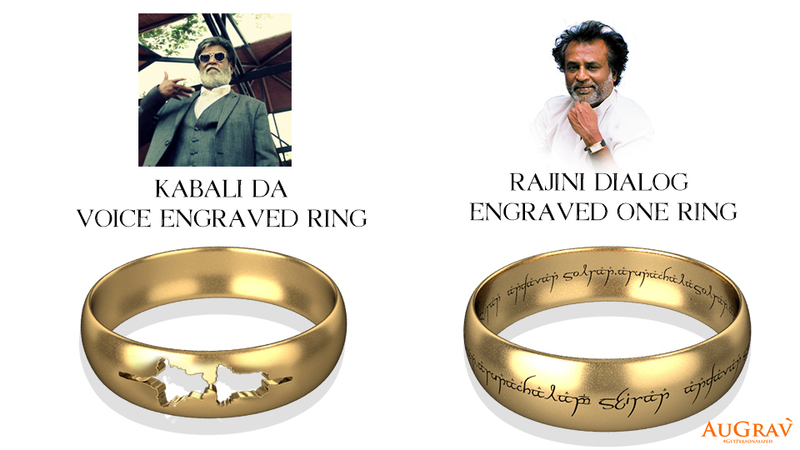 If you have got some other Rajini related customization in mind, then worry not. 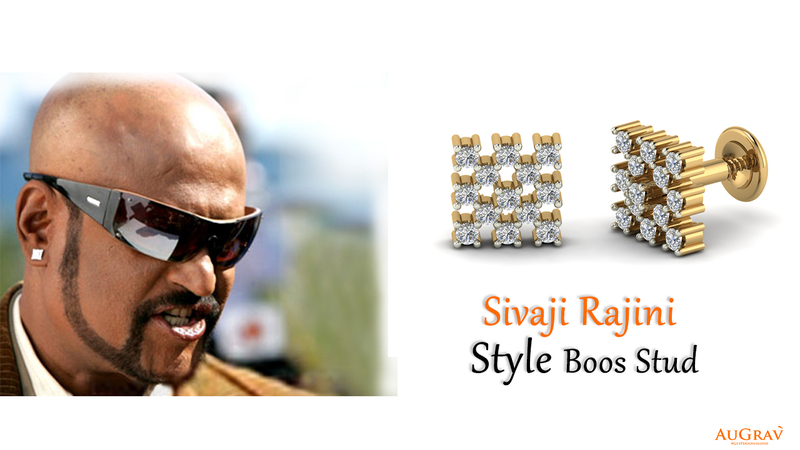 As mentioned previously we are Rajinibassadors and will do anything to give you your special Rajini product. Just give us a call and let us know your special Rajini concept. 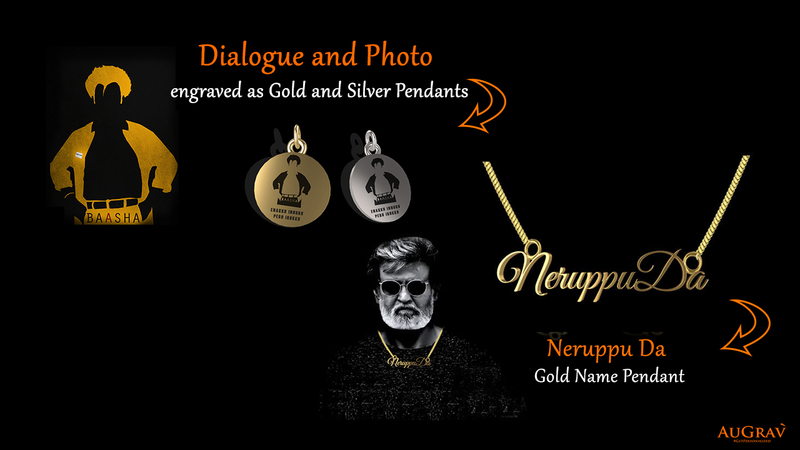 Also, if you have a special image on Rajini and want in engraved in Gold or silver or other metal, we can also do that for you. Finally, it is time to take your leave in Rajini style. 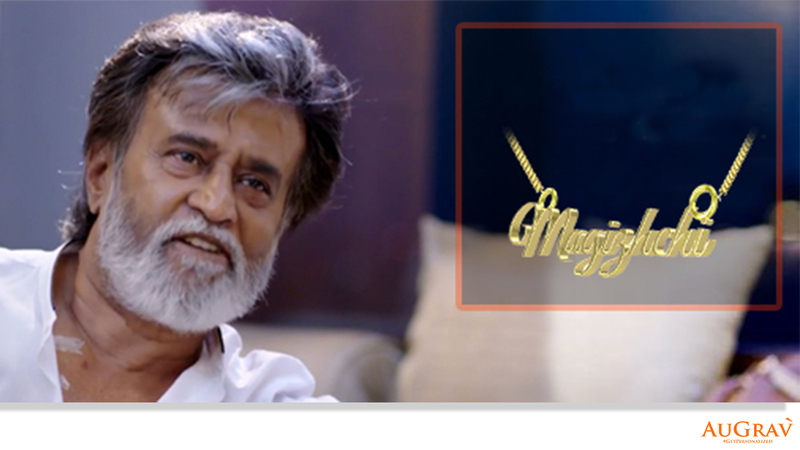 With KABALI to hit theaters, AuGrav.com becomes Rajini-bassador! Overall rating: 4.7 out of 5 based on 235 reviews.